New Delhi: The Asom Gana Parishad (AGP) dealt a blow to its state ally, the Bharatiya Janata Party (BJP), just ahead of the Lok Sabha elections by pulling out of the coalition. This comes against the backdrop of the growing row over the Citizenship (Amendment) Bill, 2016, which was tabled in the Rajya Sabha on Monday. 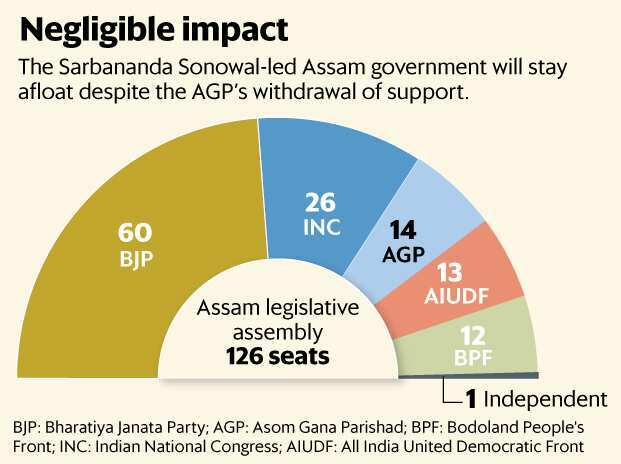 The Sarbananda Sonowal-led Assam government will stay afloat despite the AGP’s withdrawal of support. However, the Centre’s stand on the bill, which seeks to provide legitimacy and citizenship to non-Muslim minorities from Bangladesh, Afghanistan, and Pakistan, threatens to derail the process of finalizing the National Register of Citizens (NRC) as it contradicts the bill. The BJP has 60 seats in Assam’s 126-member legislative assembly, while the AGP has 14 seats, the Bodoland People’s Front (BPF) has 12, the Congress has 26, the All India United Democratic Front (AIUDF) has 13, besides an independent. “We had warned the centre earlier that we would withdraw support if the bill was passed. The party members (of AGP) met Union home minister Rajnath Singh today (Monday) and after that it was decided that we will withdraw support from the alliance," said Prafulla Mahanta, former Assam chief minister and former AGP president. The AGP’s fallout with the BJP came in the wake of the report of the joint committee on the Citizenship (Amendment) Bill, 2016, being tabled in the Rajya Sabha. The provisions of the Citizenship Act of 1955 label a person an “illegal immigrant" if the person has entered without travel documents or has overstayed the date specified in the travel documents. The purpose of the amendment was to provide Indian citizenship to those who had been forced to seek shelter in India because of religious persecution or fear of persecution in their own countries, the committee noted. The AGP had also stressed that the bill will interfere with the Assam Accord and derail the NRC process, which aims at identifying and potentially deporting illegal Bangladeshi migrants. However, according to the committee report, a copy of which has been reviewed by Mint, non-Muslim minorities who came to Assam from Bangladesh between 1 January, 1966, and 24 March, 1974, can be granted citizenship. “The legislative department has emphasized that there appears to be no conflict in the application of the proposed provision regarding exemption of minority communities coming from Bangladesh to Assam between 1 January, 1966, and 24 March, 1974, according to the Assam Accord," the report contends. The NRC was updated under the Citizenship Act, 1955, and according to rules framed in the Assam Accord, to wean out illegal immigrants from Bangladesh and other adjoining countries. The legacy data, which is the collective list of the NRC data of 1951 and the electoral rolls up to the midnight of 24 March, 1971, is being scrutinized for the purpose of updating NRC records. Assamese organizations were unhappy with the proposed amendments on the ground that the burden of illegal migrants will be passed on to the state alone, noted the committee, comprising Lok Sabha and Rajya Sabha members of Parliament. The panel rapped the Union home ministry and said it was “not satisfied with the overall scenario of deportation of illegal foreign nationals". “The MHA (ministry of home affairs) have justified that the deportation of foreign nationals is a continuous process. However, the committee is not satisfied…notwithstanding the MHA’s claim that there is a well defined deportation policy of foreign nationals," the report added.